Ethics Trouble for Gordon Fox? He is one of the highest-profile politicians in Rhode Island. And, as Speaker of the House, the most powerful. 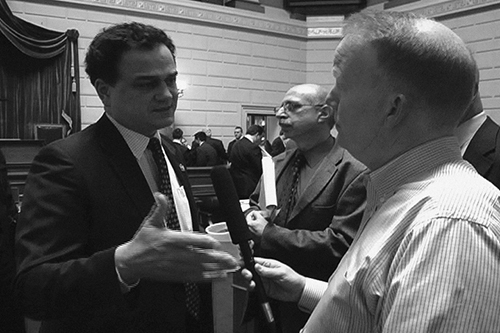 But it’s Gordon Fox’s work as a private attorney for a troubled Providence agency over much of the last decade that caught the attention of a federal agency as part of a top-to-bottom review of the (PEDP) – a taxpayer-funded business loan program that had an exorbitant default rate under former Mayor David Cicilline. Cicilline paved the way for Fox to make tens of thousands of dollars as the closing attorney on dozens of loans for an agency that operated largely under the public’s radar. A Hummel Report investigation shows that for five years, Fox did not list that income on his Rhode Island Ethics Commission financial disclosure form. We do know from post-closing filings Fox made on behalf of PEDP that he handled approximately 80 loans. But the city could not tell us exactly how much Fox made because he was paid by Joshua Teverow – PEDP’s longtime legal counsel, who Cicilline told to send some legal work Fox’s way. That all changed in April 2010, when the Taveras administration made Fox register directly with the city. Records show he then made $40,000 closing on 29 loans. Fox began reporting the PEDP income on his ethics form in 2010. Fox declined our request for a sit-down interview, so we caught up with him after a House session last month. Fox: I’m not commenting because it has nothing to do with me being Speaker; it has nothing to do with my public office. It has to do with me being a practicing lawyer who happens to be the Speaker of the House. Hummel: I understand that, but you’re also in public life and it’s a public agency. Fox: And a lot of those funds were paid for by private people. What Fox didn’t say is that in most cases, those closing fees came out of the taxpayer-funded loans, many of which were never repaid. One business complained to us that he had to pay 10 percent of a $50,000 loan in legal fees. What is unclear is who set Fox’s rates for the closings and how much he charged businesses, many of which came to the city because they couldn’t get loans anywhere else. In a review last year, the federal agency providing much of the loan money cited excessive legal fees. The program was in such disarray that the city suspended issuing new loans pending a federal review. We emailed Teverow to find out how much he paid Fox over the five years. Teverow, who was replaced as PEDP’s legal counsel after Angel Taveras became mayor, did not return our repeated emails or a follow-up phone message. Fox confirmed that he was questioned by an agency about his legal work, but would not elaborate. The Hummel Report also learned that Fox was the registered agent for at least three of the companies that got PEDP loans, while closing on those loans for the city. They included a company owned by Michael van Leesten, a political contributor to Cicilline. Peter Margulies, who teaches Legal Ethics at Roger Williams Law School, says being a registered agent poses a potential conflict, depending on how the attorney handles it. “That’s certainly a red flag if you’re engaged in a transaction with someone else on the company’s behalf, but you’re also representing that other party to the transaction,” Margulies said. “That’s probably not the best thing to do and certainly, at the very least, what you have to do is be transparent about it.’’ Fox continued to deflect our questions, specifically about being a registered agent on the other side of the loan transaction. Fox: There’s nothing to hide, but I’m not going to say something on record that’s going to somehow implicate a look at, or whatever, because I don’t really know what’s being asked. Hummel: We haven’t been able to pose the questions to you. Fox: Well, maybe I’m not the right guy to pose the questions to. Maybe you need to pose them to somebody else. Previous post: Two Sides of Kennedy Plaza: If You Rebuild it, Will They Come?